Embedded World, Nuremberg, Germany—February 25, 2014—IAR Systems®, the world’s leading supplier of embedded development tools, is today very proud to announce its fully integrated and high-performance runtime analysis product C-RUN™. C-RUN is an extension to the existing embedded development tools from IAR Systems and gives developers unique possibilities to analyze their code at an early step and improve development workflow in an instant. IAR Systems is the first embedded tools supplier to introduce fully integrated runtime analysis. By adding runtime analysis functionality to the world-leading, feature-rich development toolchain IAR Embedded Workbench®, IAR Systems offers each developer the opportunity to perform runtime analysis at every step of the way. The tight integration with the toolchain supports the full cycle of implementation, testing and debugging. This allows the user to check code quality very early in the development cycle and ensure more reliable code as well as to improve alignment with requirements and standards. C-RUN performs runtime analysis directly in IAR Embedded Workbench by monitoring the application execution. With C-RUN, developers can discover vulnerabilities very early and more easily catch errors that usually show up in the field. Memory requirements and execution speed penalty are reduced to a minimum, enabling more efficient testing on actual hardware. 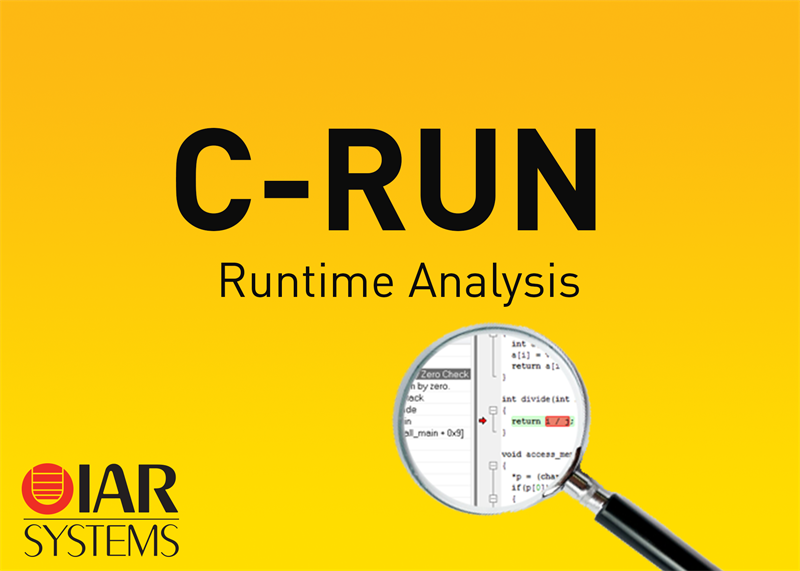 Learn more about the runtime analysis product C-RUN on www.iar.com/crun. Editor's Note: IAR Systems, IAR Embedded Workbench, C-SPY, C-RUN, visualSTATE, Focus on Your Code, IAR KickStart Kit, IAR Experiment!, I-jet, I-scope, IAR Academy, IAR, and the logotype of IAR Systems are trademarks or registered trademarks owned by IAR Systems AB. All other products are trademarks of their respective owners.